Clean any mess off any surface! IGL Ecoclean Multi is a powerful, all-purpose cleaner that provides you with the perfect answer to many different difficult messes that collect on your various vehicle surfaces. IGL Ecoclean Multi uses a soy base and effective citrus cleaner agents that are safe for nearly every surface on your car. IGL Ecoclean Multi is created using all-natural ingredients to provide powerful cleaning in the greenest way possible. IGL Ecoclean Multi will effectively break up any oil, grease, dust, and dirt, making it fast and easy to wipe clean. Each and every car comes with anywhere from five to five hundred different types of surfaces. Each of these surfaces has different characteristics that makes it unique to the way it needs to be cared for. It is for this reason that for every surface you can find on the surface of a vehicle, there is a dedicated cleaner created specifically to address that type of surface. If you are trying to clean every surface on your car and bought 50 different cleaners to do so, you would no longer be able to store your car in your garage. That is why you absolutely need product like IGL Ecoclean Multi! IGL Ecoclean Multi condenses all the hundreds of dedicated cleaners into one simple and easy product. Need to get light soil off your leather, use IGL Ecoclean Multi. 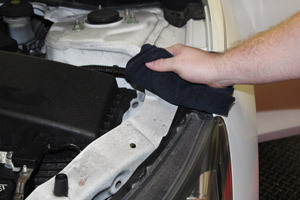 Tough grime build-up on your engine bay, use IGL Ecoclean Multi. Did you spot some tar collecting on your rocker panels? You guessed it, IGL Ecoclean Multi! There is no reason to store hundreds of cleaners in your garage or shed when you can simply use IGL Ecoclean Multi to do the same cleaning at a much lower cost! Use IGL Ecoclean Multi to clean virtually any surface that needs a good cleaning! A large concern that many car detailing enthusiasts carry with them when reading about all-purpose cleaners like IGL Ecoclean Multi is the potential to harm the various surfaces on which it is used. Typically, those concerns would be completely warranted as a large portion of APCs on the market today use extremely aggressive and dangerous ingredients that can corrode the more delicate surfaces of your car. IGL Ecoclean Multi doesn’t use those harmful and often acidic ingredients. IGL Ecoclean Multi is formulated using all-natural, citrus cleaners to provide its powerful cleaning capabilities. The soy base of IGL Ecoclean Multi means that it won’t leave behind harmful residue on your interior surfaces. The natural base of IGL Ecoclean Multi doesn’t hinder the cleaning capacity of IGL Ecoclean Multi either! IGL Ecoclean Multi will be able to tackle everything from dust on your dashboard to the brake dust on your wheels! Directions: 1. If using on delicate surfaces, dilute IGL Ecoclean Multi 1:5 with water. For all other applications, dilute IGL Ecoclean Multi 1:1 with water. Always use on an inconspicuous area first to check colorfastness. 2. Shake IGL Ecoclean Multi well prior to use. Spray IGL Ecoclean Multi directly onto the sirface and wipe it off with a dry microfiber towel.